The Pearl Izumi Men's P.R.O. Barrier WxB Glove features OutDry™ fabric that bonds the waterproof membrane directly to the outer shell, eliminating any gaps where moisture could get in. 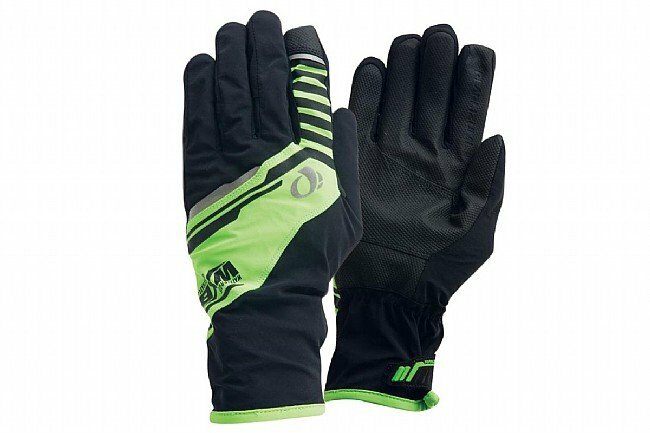 This premier waterproof glove uses an AX synthetic-suede grid on the palm for excellent durability and grip in wet conditions, and the light fleece interior is soft on the hand for superior comfort. An anatomic fit provides maximum dexterity, and the glove is safely secured with a hook-and-loop closure at the wrist. Features reflective elements for low-light visibility. Dry hands after 50 miles in a steady rain says it all! These gloves are expensive, but worth the price if you have to ride in the rain a lot. There's not much insulation, but with a pair of liner gloves, your hands will be both warm AND dry no matter how far you have to ride in the rain. OutDry gloves are better than Gor-Tex gloves. Before I purchased these gloves I spent a couple days reading the literature on OutDry, Gore-Tex, and other fabrics that claimed to be waterproof. Gore-Tex and most other supposedly waterproof fabrics have a serious defect. After an hour or two of heavy exposure to water, they will 'wet-out'. Getting an hour of waterproofing is great, but getting soaked in the 2nd to 3rd hour is horrible. Gore-Tex clothing simply cannot sustain heavy and persistent soaking. Same goes for most other supposedly waterproof fabrics. OutDry is different. It does not soak-through like Gore-Tex or these other products. Check the Amazon reviews for these Pearl Izumi gloves, and you will find consensus about these gloves being truly waterproof. I tested these gloves myself, submerging them in water for a couple hours, and there was no moisture bleed-through into the interior of the glove. I've also used these gloves in recent heavy rains without any problem. If there is any fault to the OutDry fabric, I have not discovered or read about it yet. Not many clothing vendors are using OutDry fabric. It's new to the market. Pearl Izumi put it into their gloves. Columbia Sportswear has put it into their jackets. Next I'm hoping for shoes made with OutDry fabric. My regular long fingered gloves let the cold wind in between my fingers. These took care of the wind. Am temperature was hi 30s. I've tried so many different types of supposedly waterproof gloves for fallwinter commuting, all with problems - until these WxB gloves. They're the perfect combination of actually-waterproof, actually-windproof, and actually-breathable. Their ultimate test riding home in an absolute downpour last night, my hands stayed completely dry and comfortable. They were expensive, but not nearly as expensive as buying new gloves every fall and being disappointed with them - I have a feeling I'll be keeping these a long time. Simlpy amazing three season WATERPROOF gloves ARE NOW IMPROVED!